The Cat’s Paw Nebula, NGC 6334, is a huge stellar nursery, the birthplace of hundreds of massive stars. 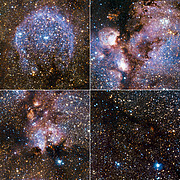 In a magnificent new ESO image taken with the Visible and Infrared Survey Telescope for Astronomy (VISTA) at the Paranal Observatory in Chile, the glowing gas and dust clouds obscuring the view are penetrated by infrared light and some of the Cat’s hidden young stars are revealed. Towards the heart of the Milky Way, 5500 light-years from Earth in the constellation of Scorpius (the Scorpion), the Cat’s Paw Nebula stretches across 50 light-years. In visible light, gas and dust are illuminated by hot young stars, creating strange reddish shapes that give the object its nickname. A recent image by ESO’s Wide Field Imager (WFI) at the La Silla Observatory (eso1003) captured this visible light view in great detail. NGC 6334 is one of the most active nurseries of massive stars in our galaxy. VISTA, the latest addition to ESO’s Paranal Observatory in the Chilean Atacama Desert, is the world’s largest survey telescope (eso0949). It works at infrared wavelengths, seeing right through much of the dust that is such a beautiful but distracting aspect of the nebula, and revealing objects hidden from the sight of visible light telescopes. Visible light tends to be scattered and absorbed by interstellar dust, but the dust is nearly transparent to infrared light. VISTA has a main mirror that is 4.1 metres across and it is equipped with the largest infrared camera on any telescope. It shares the spectacular viewing conditions with ESO’s Very Large Telescope (VLT), which is located on the nearby summit. 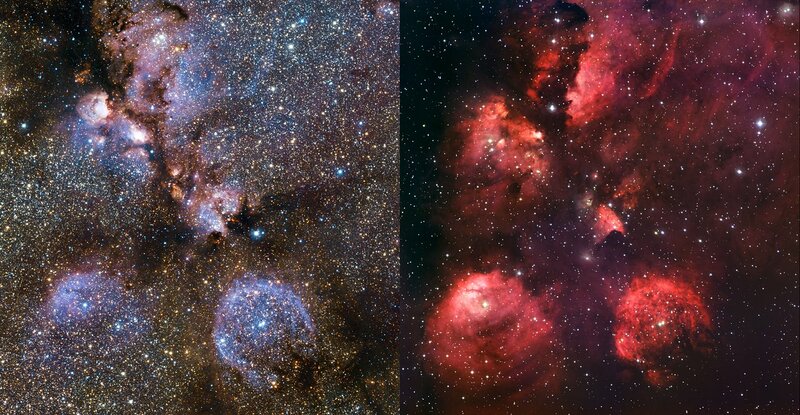 With this powerful instrument at their command, astronomers were keen to see the birth pains of the big young stars in the Cat’s Paw Nebula, some nearly ten times the mass of the Sun. The view in the infrared is strikingly different from that in visible light. With the dust obscuring the view far less, they can learn much more about how these stars form and develop in their first few million years of life. 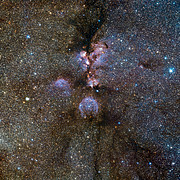 VISTA’s very wide field of view allows the whole star-forming region to be imaged in one shot with much greater clarity than ever before. The VISTA image is filled with countless stars of our Milky Way galaxy overlaid with spectacular tendrils of dark dust that are seen here fully for the first time. The dust is sufficiently thick in places to block even the near-infrared radiation to which VISTA’s camera is sensitive. In many of the dusty areas, such as those close to the centre of the picture, features that appear orange are apparent — evidence of otherwise hidden active young stars and their accompanying jets. Further out though, slightly older stars are laid bare to VISTA’s vision, revealing the processes taking them from their first nuclear fusion along the unsteady path of the first few million years of their lives. The VISTA telescope is now embarking on several big surveys of the southern sky that will take years to complete. The telescope’s large mirror, high quality images, sensitive camera and huge field of view make it by far the most powerful infrared survey telescope on Earth. As this striking image shows, VISTA will keep astronomers busy analysing data they could not have otherwise acquired. This cat is out of the bag.